Hugo Morthanigo reports from Singapore on the upcoming meeting between Trump and Kim and how the local authorities plan to dispose of the nuclear fallout. 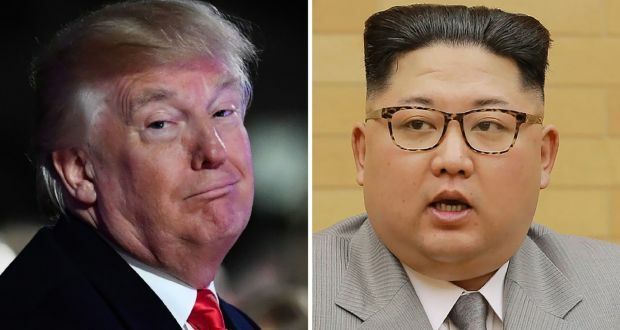 If you were selecting two people to come together to further the cause of denuclearisation and world peace it’s unlikely that Trump and Kim would be high on your list of contenders. You might even consider that bringing them together would be more likely to cause a nuclear explosion than prevent one. Trump has referred to Kim as “Rocket Man” and “Fatman” and Kim has deemed him to be “a depraved and stupid guy”. Aides planning the meeting however take some comfort from the fact that that’s the least derogatory term that’s been applied to Trump since he got a Christmas Card from Pauline Hanson. Eminent psychologists believe this will be the biggest clash of egos since Alan Jones interviewed Kevin Rudd. Singapore deserves the gratitude of the whole world for agreeing to host the meeting given its propensity to scare away the tourists and the threat of Trump seeking political asylum there to avoid persecution back home by Robert Mueller. Both sides are still giving profound consideration to the meeting agenda. In order to set the right tone, the Trump camp has suggested that things should kick off with their guy either receiving a Nobel Peace Award or being declared the winner of America’s Got Talent. Then discussions are likely to move to the heart of the matter, covering topics of vital interest like are nuclear families more radioactive than Alan Jones, is there a chance of North Korea’s nuclear Arsenal playing in the Premier League and is Stormy Daniels as explosive as enriched plutonium? Trump is likely to press Kim on switching to incontinent ballistic missiles which are much less of a threat because they merely piss over everybody. As a key move to encourage North Korea’s nuclear disarmament programme Trump will be prepared to take Kim’s entire missile stockpile off his hands but they will of course be subject to his new import tariffs. Robert Mueller will be present at the meeting to check that there’s no collusion going on between them and Trump isn’t there merely because Kim promised to dish some dirt on Hillary. It is absolutely inevitable that if Trump and Kim agree to anything they’ll both change their minds the following day after Kim has reported back to Beijing and Trump has gone on Twitter to explain that if he doesn’t renounce the agreement with Kim then Iran might have cause to feel aggrieved that he’s treated them unfairly. In the final analysis it will be a major diplomatic triumph to get Trump and Kim in the same room together let alone preventing their discussion being bugged by Russia and a transcript appearing in Wikileaks. Any outcome beyond that would take a miracle, Kim becoming a capitalist, Trump finding a cure for megalomania or a mini-series produced by Netflix.